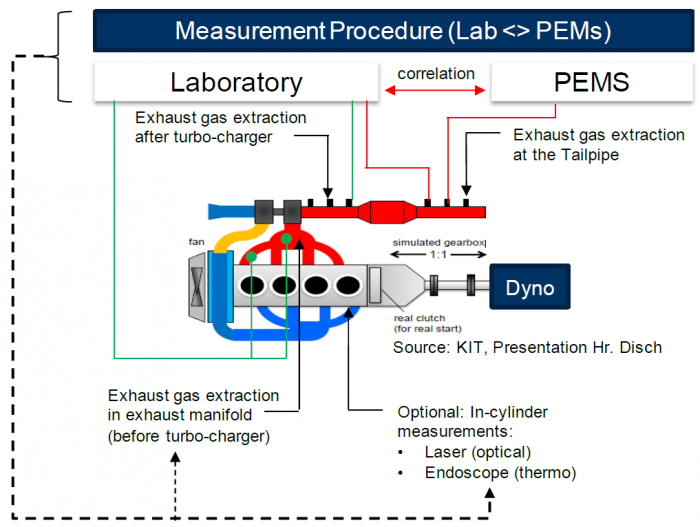 The PEMs4Nano project (P4N) addresses the development (based on current direct injection gasoline engines) of measurement procedures down to 10 nm, providing a contribution to future regulation on particle emissions, in particular in real driving conditions. This key contribution is expected to be the technical guidance based on the insight gained in terms of the formation and evolution of particle dynamics, the identified uncertainties, process sensitivities, and the optimisation and demonstration of measurement technologies in real driving conditions. The activities planned in the project will also support the understanding, measurement and regulation of particle emissions below 23 nm (with the threshold of at least 10 nm). The underlying concept in P4N is to optimize and demonstrate the usage of existing particle measurement technologies for analyzing particle emissions in the exhaust gases of internal combustion engines, especially in mobile applications. It is postulated that a solid understanding of the particle origin and lifetime through the exhaust gas system (as opposed to just focusing on the tailpipe output) is essential to ensure robust and reliable measurements, especially when targeting these ultra-fine particle under automotive conditions. particle characteristics (composition, morphology, and size distribution that have a major influence on the resulting particle number) in the system that then is fed back into the methodology by demonstrating the use of simulation models to guide the application of measurement technology, especially in this area of ultra-fine particles in harsh automotive exhaust.